Eka's Portal • View topic - Minecraft tech support. Well well, you have a problem with minecraft? Last edited by Potato on Sun May 15, 2016 9:43 am, edited 1 time in total. You could try reloading your minecraft aswell? Last edited by Potato on Wed May 11, 2016 2:53 pm, edited 1 time in total. Well, based on this log, your inventory tweaks mod had an error. Last edited by Potato on Wed May 11, 2016 2:54 pm, edited 1 time in total. Eve is right, use a version for 1.9, not 1.8.9. Say, would someone be able to help me out here? I recently tried to get into the server, but I keep getting an error message. 'Outdated client. Please use 1.9.2'. What exactly do I need to do to update the client? tuc1357 wrote: Say, would someone be able to help me out here? I recently tried to get into the server, but I keep getting an error message. 'Outdated client. Please use 1.9.2'. What exactly do I need to do to update the client? Hopefully this helps? 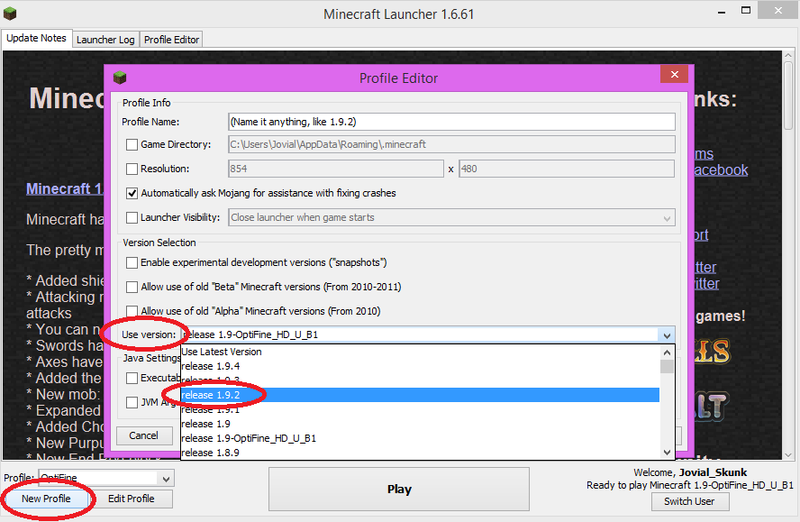 Just click "New profile" in the launcher, and then select version 1.9.2. After that, click "Save profile" and then Play. The game should download the new version automatically. Remember it won't work on versions before or after! You need 1.9.2 exactly. (ie; 1.9 won't work, nor will 1.9.4) If you need help installing more advanced stuff like Forge or Optifine, I can help you out with that too! But if you just want to play the game, you don't need to worry about those. Thanks for the advice! I've managed to get in now. It recently dropped support for 1.8 tho. Here's my error message... Assistance? OpenGL: AMD Radeon HD 7450 GL version 4.5.13397 Compatibility Profile Context 15.200.1045.0, ATI Technologies Inc.
Are you installing the wrong optifine or something? For some reason every time I join it just either times out or straight up disconnects me. Didn't happen until today and I don't understand why. JingleJangles wrote: For some reason every time I join it just either times out or straight up disconnects me. Didn't happen until today and I don't understand why. The server is down. None of the admins are on to fix it. I was there when it went down. Said "Report to the admin: PLAYER_INTERACT "
DDoS, Major lag, or just a shut down, the server is inaccessible today until cookie or an admin get on. I can't seem to log in, There's 4 people currently online, so the server's running. But when I try logging in, it just says "logging in" for a while before saying "Disconnected". I've ried restarting the computer and reinstalling minecraft, but still nothing. Edit: Looks like it fixed itself, unless some admin did something to the server I guess. Well, I just tried to join the server. I managed to spot one comment of recognition before my game just flat out CRASHED. There's not a Cookie that can resist my charm. Do you happen to like cheesecake?